First of all well done. If you are reading this then you’ve got past the first hurdle of cooking with heart. I was thinking about putting the finished recipe as the first image but I wanted you to be under no delusion that cooking heart is something that you have to get your head around and isn’t for everybody (in fact I can imagine both my mum and girlfriend balking at the idea of this post). The rewards, however out way the initial daunting task of preparation. Not only is heart a tasty bit of meat, it’s also extremely cheap (my four lamb’s hearts were under £2 from my local butcher). So if you can get past the unnerving process of preparing the heart you’ll be in for a culinary treat. There are a few recipes for heart, one of the most popular and the one I make the most is Hugh Fearnley-Whittingstall’s devilled lambs heart on toast which can be found in his River Cottage Every Day Cookbook. 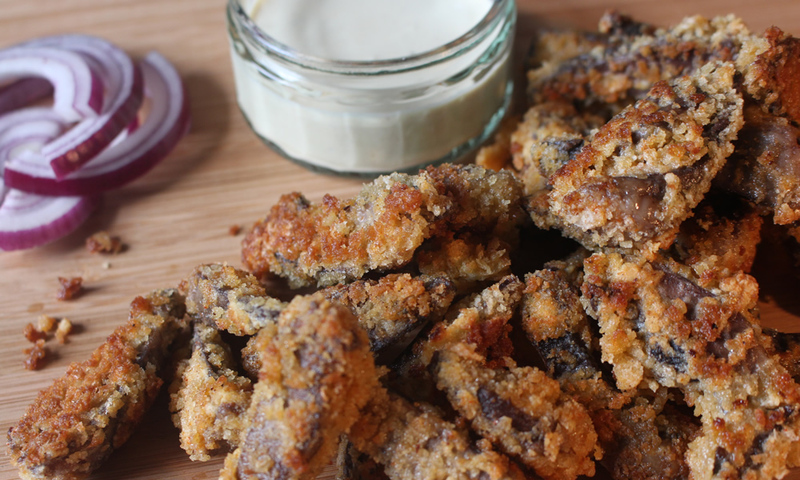 It’s a perfect introduction to cooking heart, but if you want to try something different and just as simple the recipe below for my breaded heart goujons with honey mustard dip is worth a go. 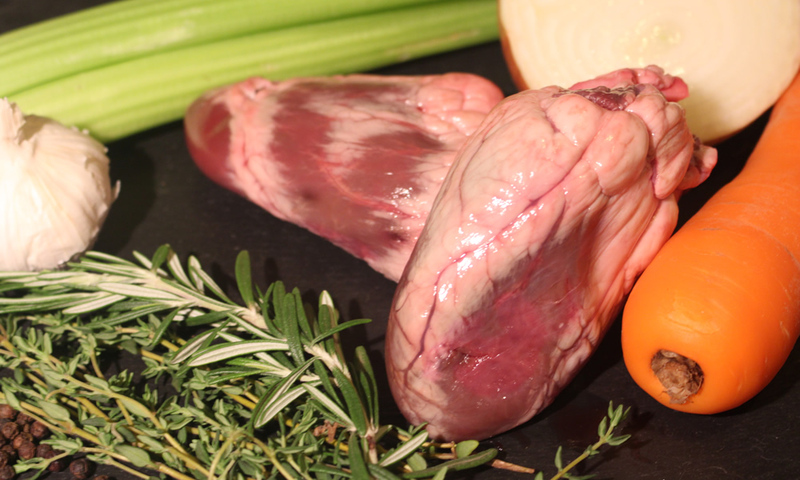 As the heart is a very active muscle it needs to be tenderised and to do this it needs to be boiled. Start by cutting each heart in half lengthways and then again so you end up with quarters. Remove the valves from the top of the heart and trim the majority of the white fat away if there is any. Wash the heart pieces thoroughly to remove the blood and add them to a large pan. Quarter the onion and roughly slice the carrot, adding them to the large pan with the hearts. Halve the bulb of garlic adding it to the pan along with the thyme, rosemary and peppercorns. Cover with cold water and put over a medium heat and simmer for a hour and a half until the hearts are tender. While the hearts are cooking away you can prepare the dip. In a bowl add the creme fresh, mustard and honey and stir thoroughly. Season with salt and pepper to taste and set aside in the fridge until ready to serve. After an hour and a half or so the hearts should be ready and tender. 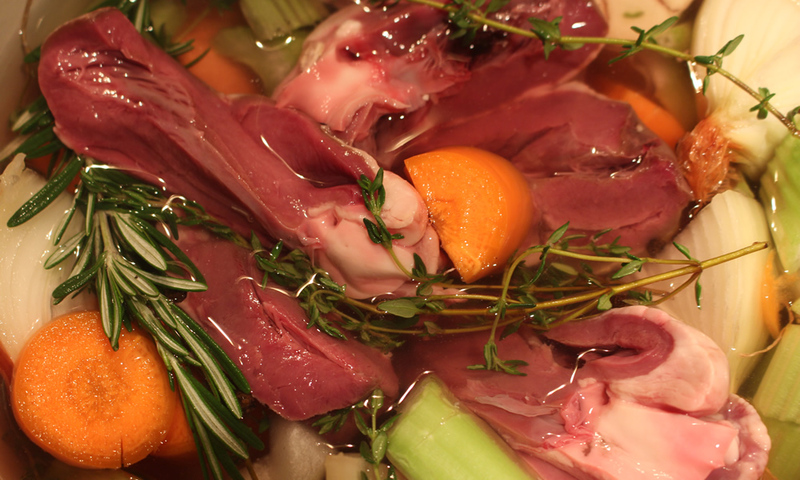 Remove the heart quarters from the stock and put on a chopping board. Slice the heart into goujons about a half a centimetre thick and leave to cool. Now you are ready to make the coating. In one bowl add a good amount of flour seasoning it with salt and pepper. In another bowl add the eggs and whisk well. In a third and final bowl add the breadcrumbs and the cayenne pepper along with a little salt and pepper. Take the heart pieces and dip in the flour, then the egg and finally the breadcrumbs making sure that all sides are covered well. Put the coated heart pieces on a plate ready to be shallow fried. Heat about 4 tablespoons of oil in a frying pan or wok and shallow fry the heart until golden on all sides (you might have to do this in batches). When all the heart is ready plate up and serve with the mustard honey dip.